Album Review: Mac Leaphart- Line, Rope, Etc. 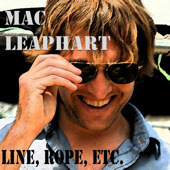 Leave a Comment on Album Review: Mac Leaphart- Line, Rope, Etc. And she was too young to be any man’s wife. And all I had on her was my family name. And I watched as she watched him with her eyes burning wild. And I knew I could never give her that smile. She was so restless, so I pretended not to know. But it just kept at me—lord, I couldn’t let it go. Elsewhere Leaphart utilizes the talents of his good friend and SC folk legend Danielle Howle, who contributes urgent harmony vocals on the lovelorn opener “No Way,” and an elegant twang of the country duet “Cold Hard Truth.” The latter opens with the line “you could write a book with the words we wasted,” and even though you know where the rest of the song is going, you can still bask in the gorgeousness of the two’s voices and the understated pedal steel that bolsters the tune. The song’s musical and lyrical cousin is a tune that Leaphart sings with much more bravado, “White Line Mercy,” a honky-tonk lament praying “lord have mercy on the man whose woman loves cocaine,” a line which tenderly changes to “lord have mercy on that little girl who loves that goddamn cocaine” at the end of the song. Throughout the record Leaphart shows a deft touch in his evocation of all things Southern—screen doors slam, old men brown-bag whiskey, and we’re all trying to get saved after partying a little too hard the night before. If those things don’t make you ache a little bit, you are gonna have a hard time convincing anyone you have a Southern soul. Come out for the singer/songwriter showcase (featuring Todd Mathis of American Gun, Zach Seibert, and Rob Lindsey) at the White Mule on Feb. 12th, or just download the guys record (he gives it away on his website) to see what I’m talking about.